Need a quick, classy DIY project to give at your next baby shower? 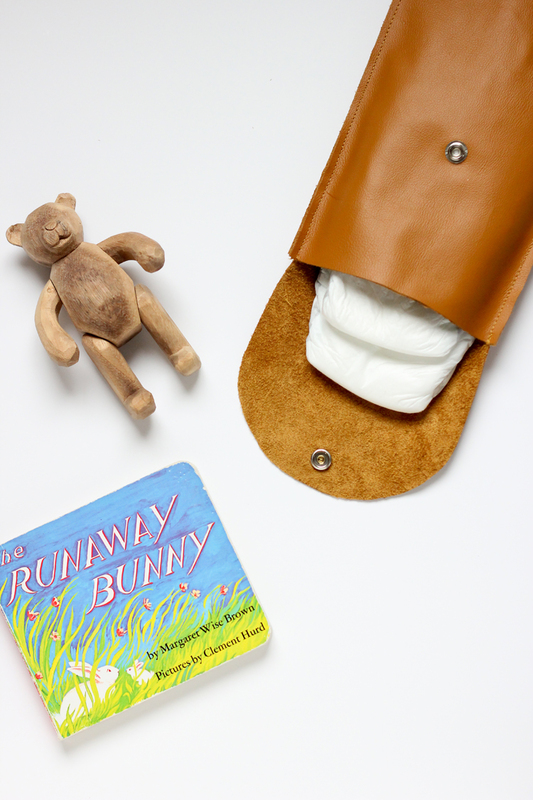 I’m bringing home this tutorial I shared for Amy’s maternity leave last month. If you don’t know Amy already, you must! Her blog is a feast for the creative mind and full of beautiful pictures! Hi! I’m Delia from Delia Creates and I’m excited to be guest posting here for Amy while she’s snuggling her new adorable babe. 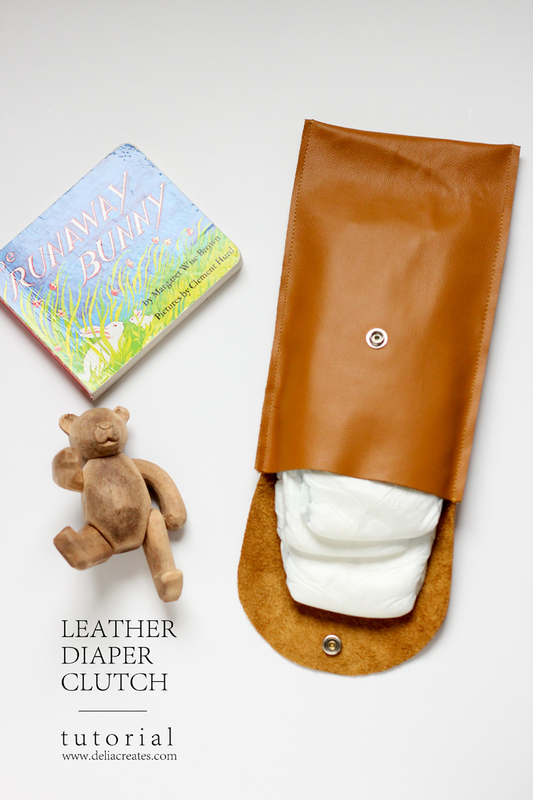 I wanted to make something in honor of her new baby, so I’ve created a tutorial for a simple leather diaper clutch. It’s just two lines of sewing and a heavy duty snap! Very easy and super quick. Let’s jump right into the tutorial, shall we? 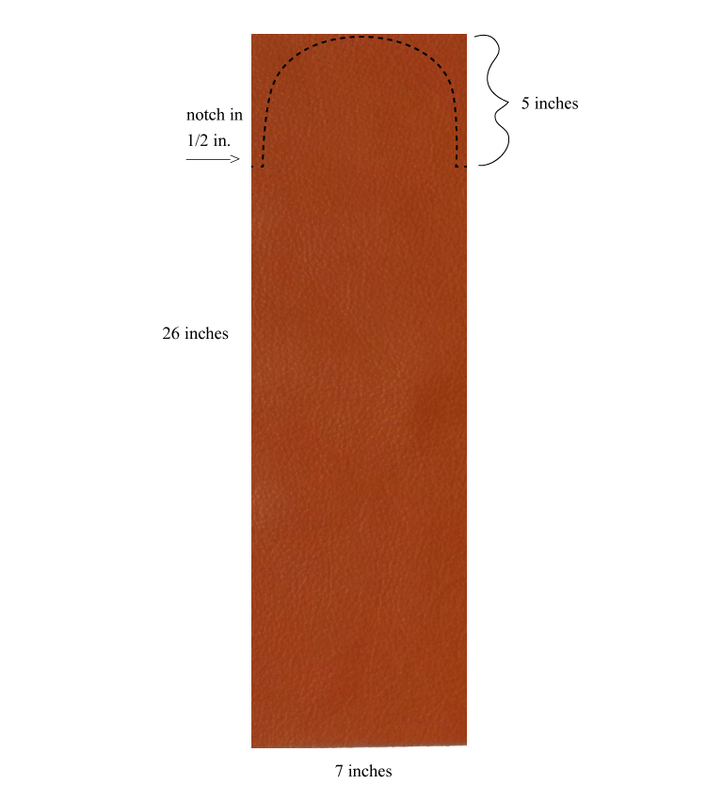 – Cut a piece of leather 7 x 26″. – Five inches down from one short end, cut 1/2″ notches out of the sides. 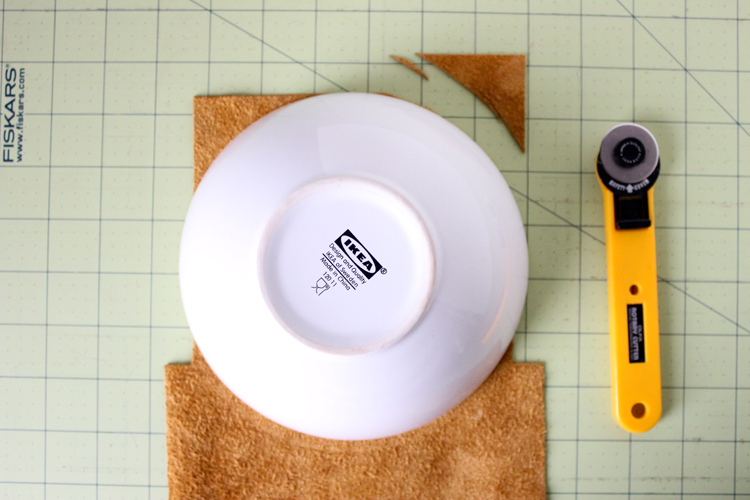 – Round out this notch end, using a cereal bowl as a guide. I used my small rotary cutter and then smooth everything with scissors. 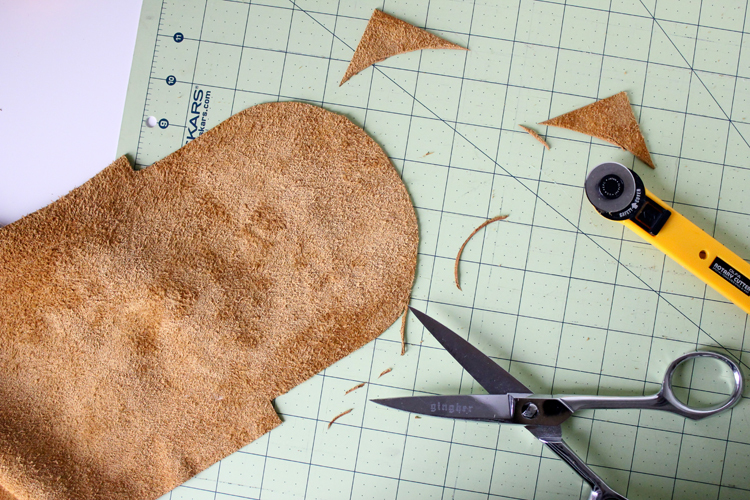 You can also, simply trace and cut with scissors. 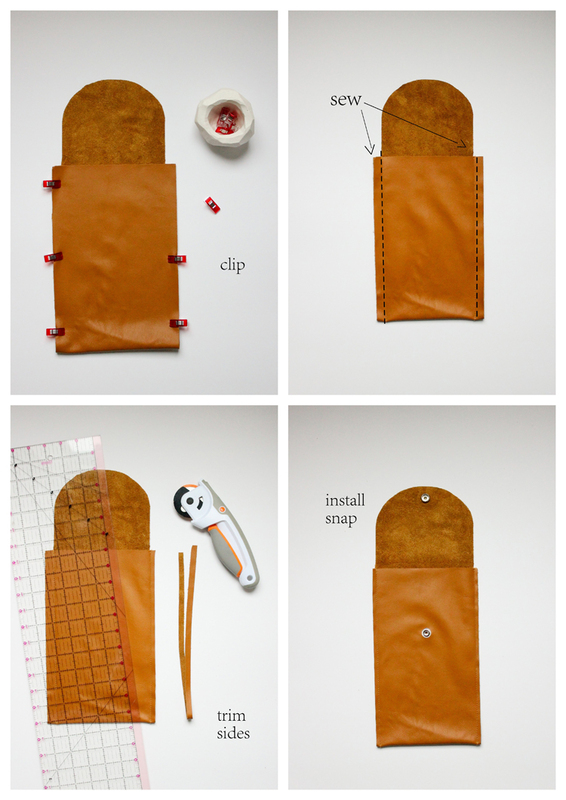 – Fold the remainder of the rectangle of leather in half, with wrong sides facing. Clip sides in place with clover clips or small binder clips. Do not use pins, as they will leave permanent holes. – Sew up sides with 1/2″ seam allowance. Use a leather needle and a stitch lengthened to 4 mm. The longer stitch will create a more professional looking finish and will help the leather feed through nicely without puckering. 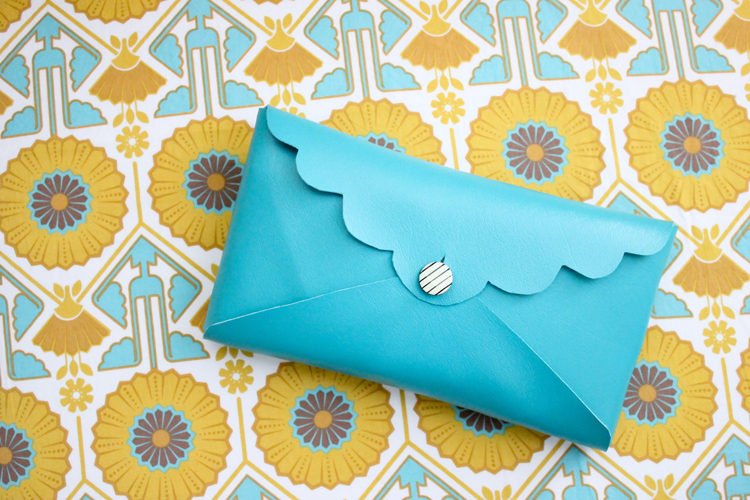 Be sure to go slow, so you don’t stretch out the leather too much as you sew, and be sure to back stitch several times at the top of the clutch by the flap. Note: You can get away with using a universal needle, if you don’t have a leather needle, but the stitching will look much nicer with a leather needle and the seam will be stronger. 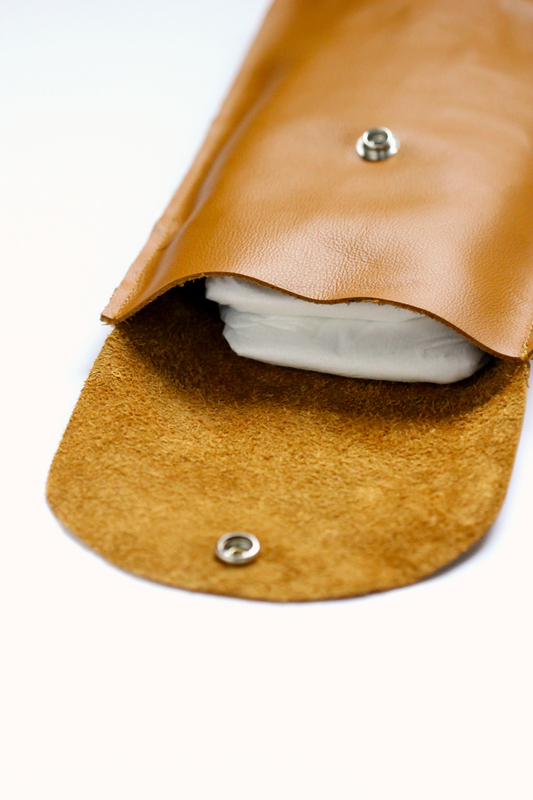 – Trim the seam allowance down to about 1/4″ to clean up the look of the clutch. – Install the snap according to the package instructions. There are several types of snaps you can use. I prefer the heavy duty or western snaps. 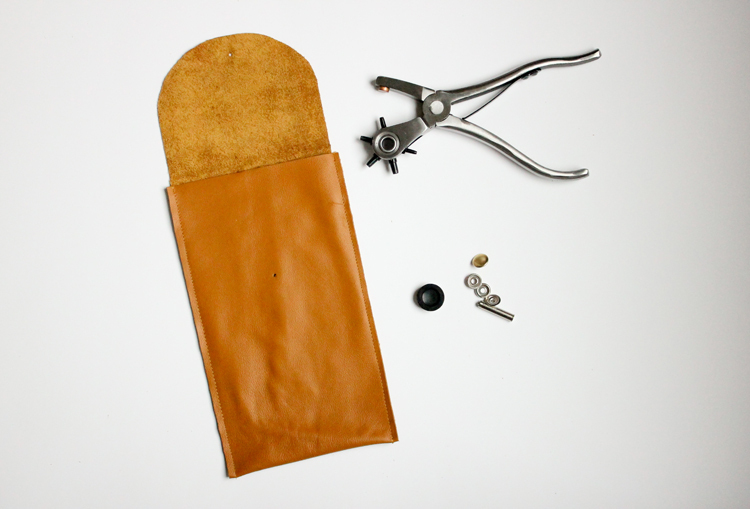 Note: If you don’t have a leather punch, you can use a snap punch tool, or a small pair of sharp embroidery scissors to score a hole into the leather. Thanks for having me Amy! Congrats to you and your beautiful family. I am so so happy for you. Give that baby lots of kisses for me! Love this, stylish but useful! Where do you get your leather? I have the hardest time finding non-tacky pieces/colors (ie metallics and weird finishes) without having to buy an entire hide. Thanks! I got this hide from The Leather Hide Store. I know what you mean about having a hard time finding good smaller pieces. Unfortunately, this is from a larger hide. I have liked every hide I have gotten from The Leather Hide Store though and have gotten a lot of use out of all of them. In fact, I am still not completely finished with the first one I got from there! :) They have smaller remnant pieces that are less expensive and are worth a look. 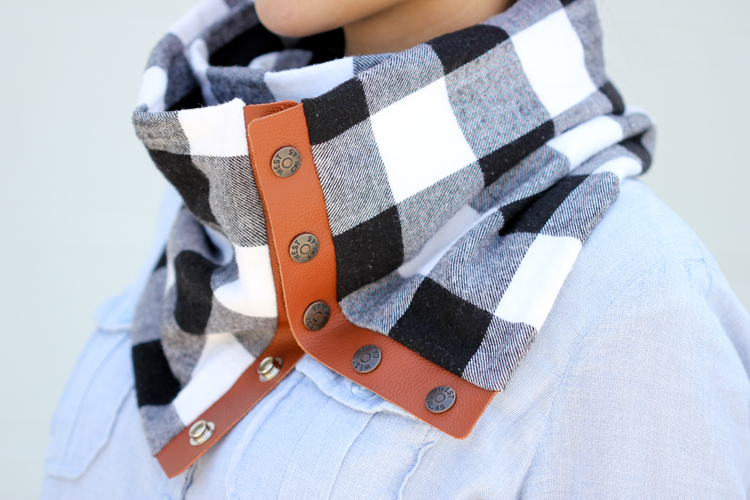 Or you can upcycle a leather skirt, large jacket, large tote purse, etc. from the thrift store. I hope that helps. 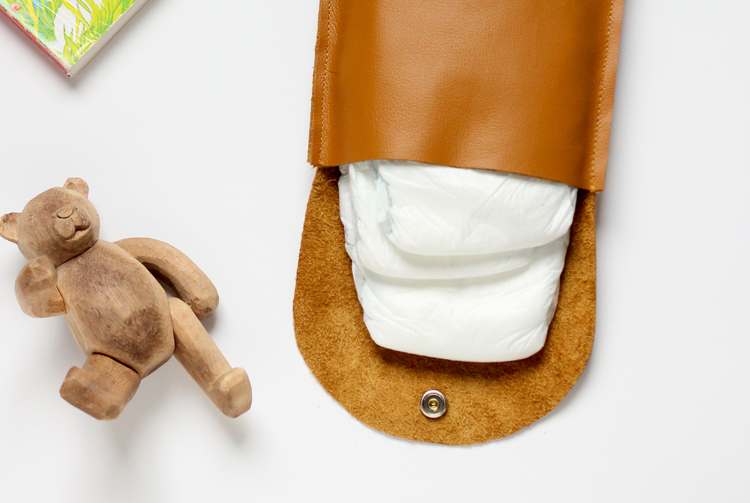 That is a really classy diaper clutch! Leather makes everything better. ;-) I really love the carved bear in the photos too. I love this! 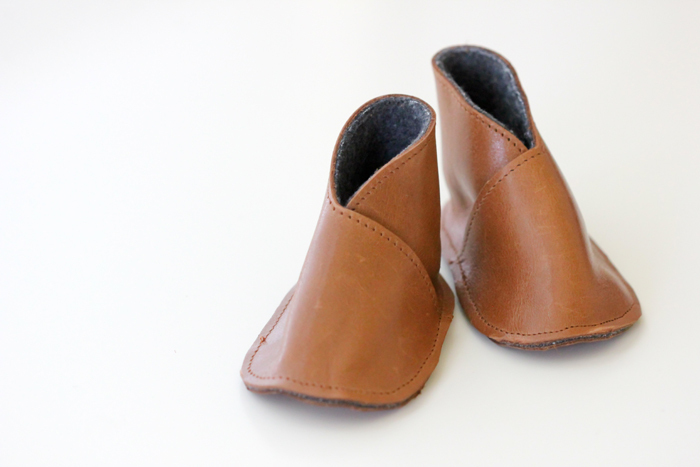 I want to sew more with leather, but am having a hard time finding a reasonably priced supplier. Do you have any that you recommend? Thank Becca! I like The Leather Hide Store. It does seem pricey at first, but one hide will stretch far for lots of projects. If you don’t want a hide, you can get a relatively good deal on their remnants. If you are not ready to make an investment of that magnitude, you might want to try Tandy Leather Outlet. They have smaller pieces of leather. As with anything, the smaller pieces are not as good a deal as buying larger/in bulk, but if you just want to make one or two things, it might be more practical for you. Another source is the thrift store. Sometimes you can find big leather trench coats or skirts that have a lot of leather fabric you can upcycle. OR, you can use faux leather found by the bolt at Jo-Ann. They have a few nice faux leather options there. I hope that helps! 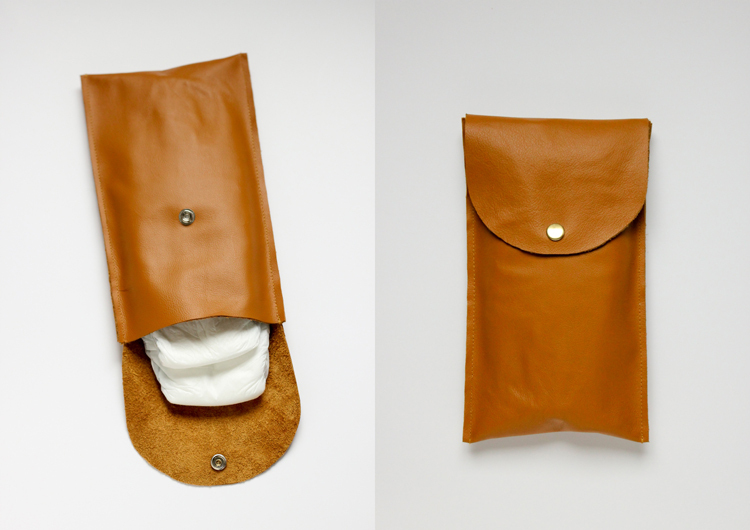 Delia, clever diaper pouch idea. 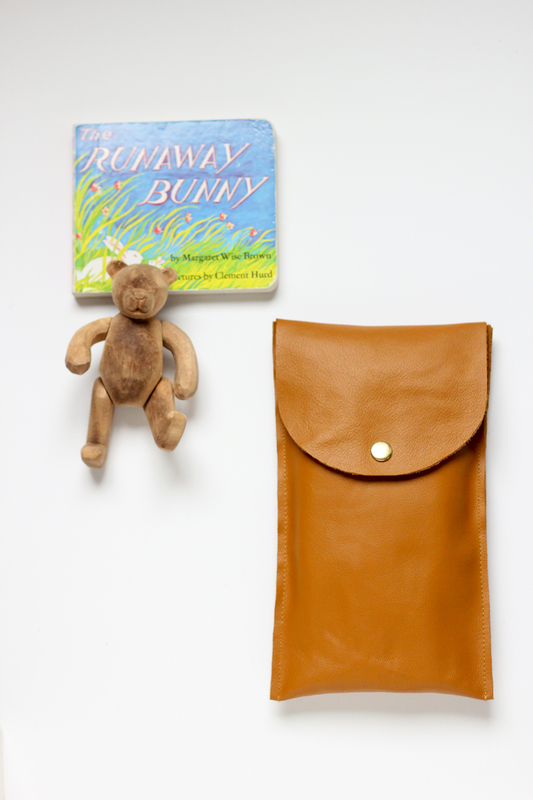 Granddaughter is due mid September so I’ll be hunting leather at thrift stores soon. Thanks for the tutorial! About the WOODEN BEAR: I love it! Where did you find it? Even if not available I would love to hear the story behind it. So adorable. Oh Delia, like those above me I adore that bear too! 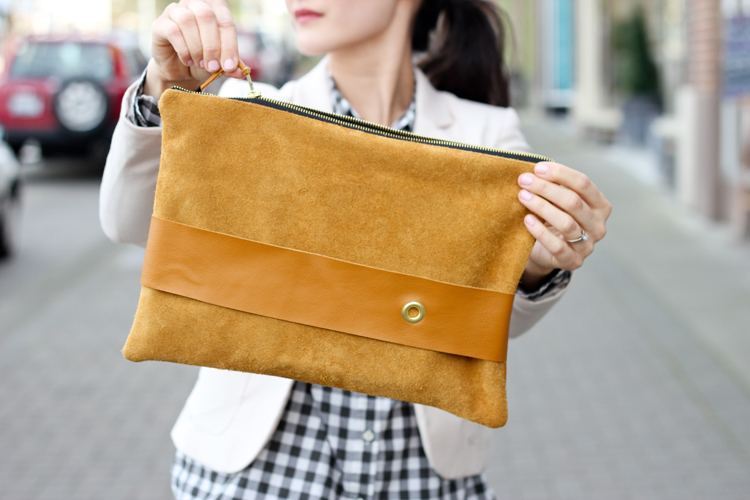 But I also really love how you have made a clutch out of leather instead of the material ones that I have seen around. 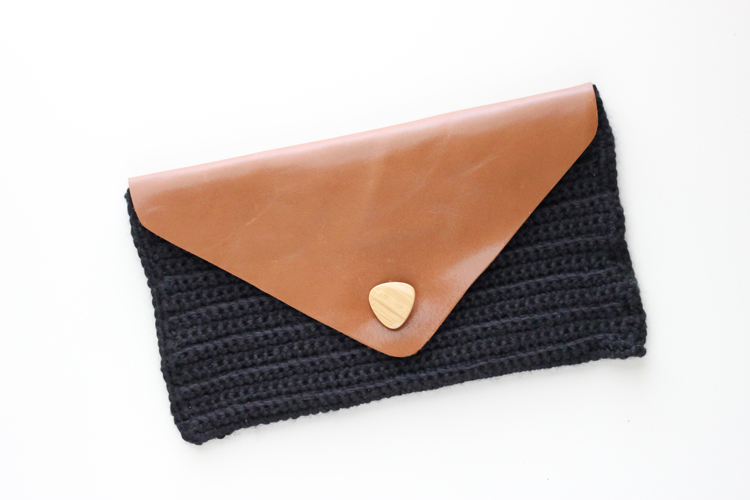 So elegant and nobody would ever guess that it is a diaper clutch. Really love it!